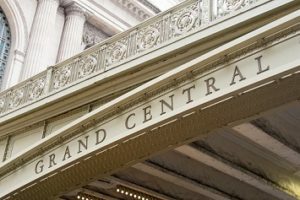 Nordic culinary entrepreneur, Claus Meyers, wants the proper tools in place for surveillance at the Great Northern Food Hall and Agern restaurant, both in the Vanderbilt Hall of Grand Central Terminal, NY. The historic nature of the facility, the high-bandwidth multisystem requirements, and large user-base demands, brings a challenging installation for many reasons. Vanderbilt Hall in Grand Central Station terminal is a unique historic site that now serves as home to the Great Northern Food Hall and adjacent Michelin-star awarded Agern restaurant. In the heart of Manhattan, more than 750,000 people pass through Grand Central Terminal every day on a 24/7 basis. The terminal is a historic landmark with much of its structure over 150 years old. These factors create unique requirements for the installation of a new integrated IP video security, Point of Sale (POS), and services network at the food hall and restaurant. Agern, “Acorn” in Danish, features beautifully designed spaces that mix elements of Scandinavian aesthetics with organic shapes and natural elements. Great Northern Food Hall consists of eight pavilions presenting eight different casual food styles based on fresh local goods and influences. According to Baake, the key functional requirements for the video surveillance system are coverage for liability, theft control, and the ability to monitor daily operations with POS system integration. He emphasizes the importance of being able to capture and store video data from the many areas in the restaurant and food hall and to have local as well as remote access to viewing the video. Chris Kossifos, Managing Member of CK Technology Group, the integrator for the project explains how the CK Technology team combined resources and minimized the physical footprint of the installation. CK Technology deploys a single IP network to integrate and transport six distinct systems: Milestone XProtect Corporate video surveillance software managing Axis network cameras, MICROS Retail Systems POS terminals and printers, computers that access the Internet, WiFi for guests and staff, digital signage, and audio. Each service shares the bandwidth of a single network cable to each station, which was important because there was no space to run more. The team could not drill any holes or touch the walls and anything installed had to be able to be removed with 1 week’s notice, leaving the space looking exactly as it has for the last 100 years. By using various Axis cameras with their Zipstream technology, data is compressed, minimizing bandwidth to efficiently send over the network. The Milestone video management software also provides options for setting frame rates, video quality, and recording parameters.